Issue 98 of Rue Morgue magazine hits newsstands March 1st. It features my interview with and career profile of the inimitable horror illustrator J.K. Potter. I think it's safe to say that J.K. and I really hit it off. He was a true pleasure to talk with and his interview is fascinating. The Rue Crew appears to have put together another great one. 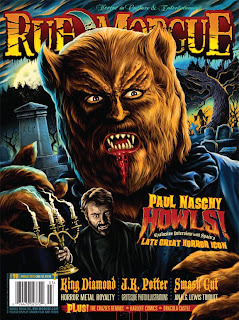 How can I complain when my work appears in an issue with both King Diamond and a Paul Naschy cover story? It doesn't get much finer than that.